Dairy free coconut yogurt is the perfect way to start your day! 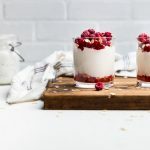 No more expensive yogurt trials, you need just 2 ingredients for this dairy free, gluten free, plant based coconut yogurt recipe! When you go dairy free and you like yogurt, you may hear the train coming to a crashing halt. It’s hard to find a good dairy free yogurt. Not only that, but it’s expensive too. 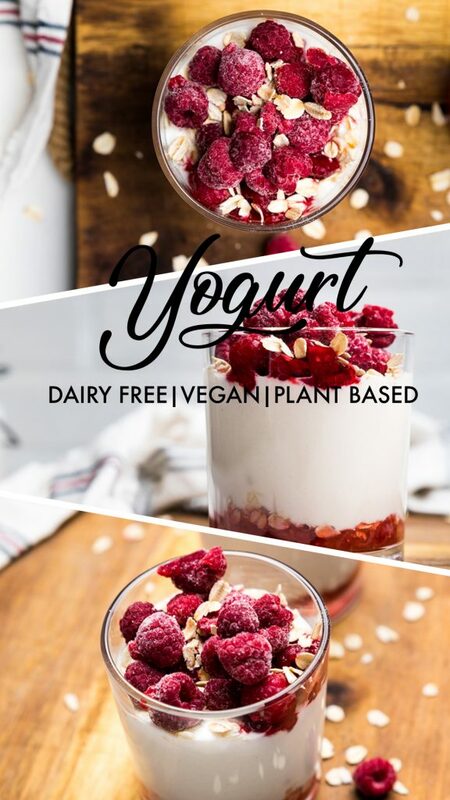 Most dairy free yogurt brands run between $1-2 per 5oz. And while they are becoming easier to find, dairy free yogurts don’t always live up to the hype. 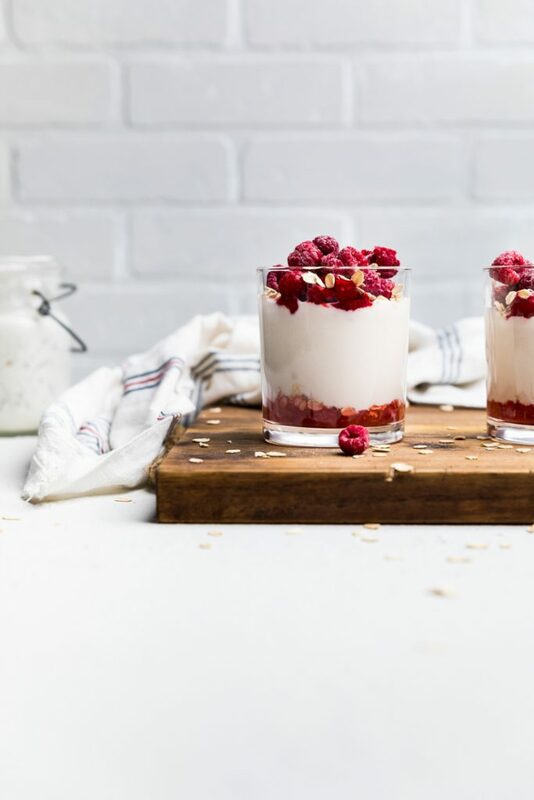 Given all those factors, we wanted to give you one of the easiest dairy free yogurt recipes that you can find that is cost effective and insanely easy to make. 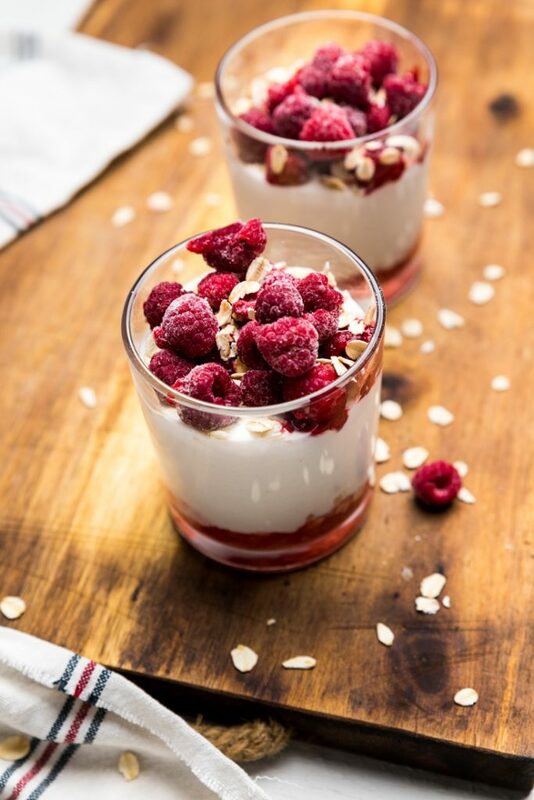 What ingredients do you need to make dairy free coconut yogurt? 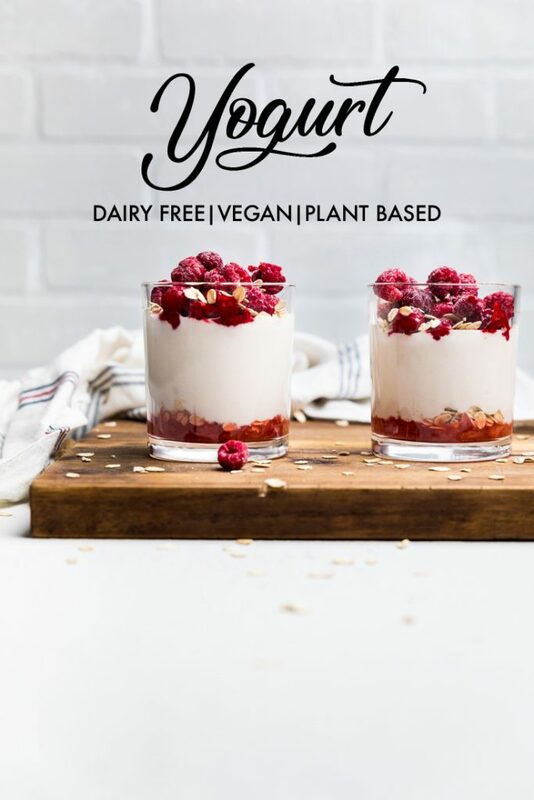 This dairy free coconut yogurt needs just two ingredients: canned coconut milk and vegan probiotics. It’s true. That’s all you need for this dairy free coconut yogurt recipe. The most important part of making dairy free coconut yogurt is that you need to use full fat canned coconut yogurt. If you use reduced fat or bottle coconut milk, this recipe will not work. How do you make dairy free coconut yogurt? This dairy free coconut yogurt is so easy to make that it shouldn’t even be called a recipe. Alas, here we are. To start making this dairy free coconut yogurt recipe you will shake up an entire can of full fat coconut milk. Then, pour the can into a glass jar. Then, dump the contents of four vegan probiotic capsules into the jar and stir with a wooden spoon. Once stirred together, cut a 12 inch piece of cheesecloth and fold in in half until you have a square that covers your jar. Use a rubberband to hold the cheesecloth onto the jar. Place the jar on the counter and let sit for 48 hours. Once the time has elapsed, remove the cheesecloth and either place in the fridge for get cold or serve immediately. Add fresh berries or granola to the top. What are good toppings for dairy free coconut yogurt? 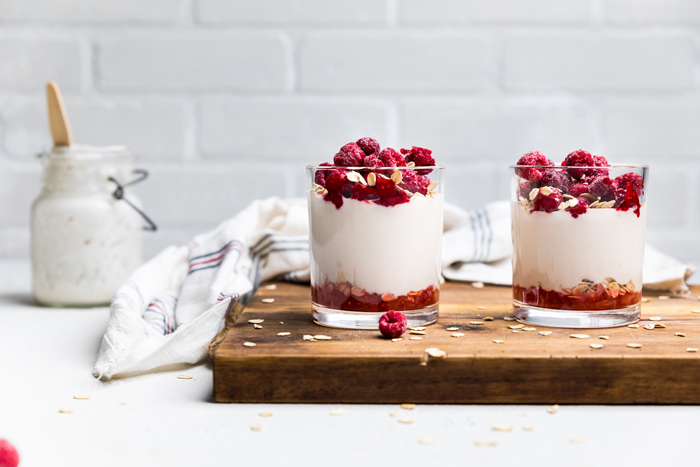 Now that you have your dairy free coconut yogurt made, you may wonder what is the best way for you to top your vegan coconut yogurt. Great question. One of our personal favorite ways is by topping it with a variety of fresh berries. 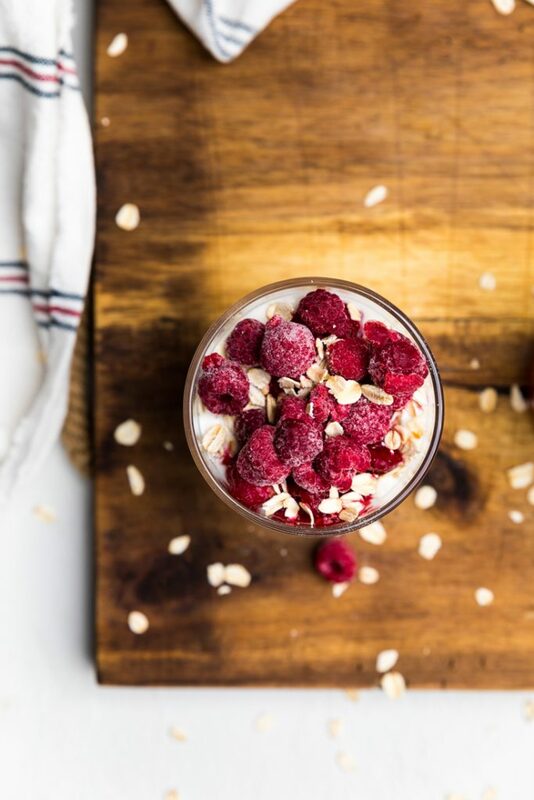 In the pictures, you see smashed strawberries at the bottom and the topped with raspberries. This dairy free coconut yogurt is also amazing with blueberries. Shake an entire can of full fat coconut milk. Pour the can into a glass jar (like a mason jar). Dump the contents of four vegan probiotic capsules into the jar, then disgard the plastic capsules. Once stirred, cut a 12 inch piece of cheesecloth and fold in in half until it is a square that covers your jar. Use a rubberband to hold the cheesecloth onto the jar. Place the jar on the counter and let sit for 24-48 hours. If after 24 hours, it doesn’t appear thick enough, let sit for another 24 hours. Once the time has elapsed, remove the cheesecloth and either place in the fridge to get cold or serve immediately. Add fresh berries or granola to the top if desired.